Matt spotted this exceptional lowercase L on a trash bin at Papa Chito's mexican restaurant in San Diego. 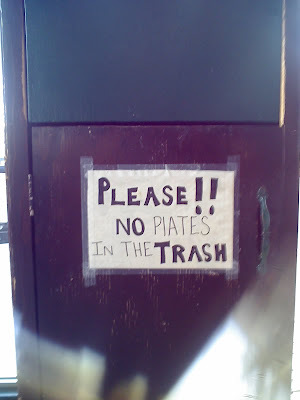 There are absolutely no other lowercase letters in the sign, which reads "PLEASE!! NO PlATES IN THE TRASH", making this a prime specimen. And there really was ample room to spell PLATES with an uppercase L. One might argue that the author was trying to keep every line of text centered, and realized this would not be possible unless the lower rung of the L was omitted. So the sacrifice was made ... but at what price? hahaha... "at what price" indeed. the horror! Judging by the conventional L in PLEASE, the creator of this sign is either bipolar, obsessed with duality or both!